Cycling Scotland’s road safety awareness campaign educates drivers on how much space to give people on bikes when overtaking. Using out-of-home media, radio, print, television, newspapers and social media, our annual springtime campaign targets drivers across Scotland to give a car's width space when overtaking people cycling. In previous years our campaign has supported Police Scotland on Operation Close Pass and has won a Scottish Transport Award for “Most Effective Road Safety, Traffic Management and Enforcement Project”. Almost two-thirds of people across Stirling, Inverness, Dundee, Glasgow and Edinburgh said that the campaign has made them more aware of the space to give people cycling on the road. 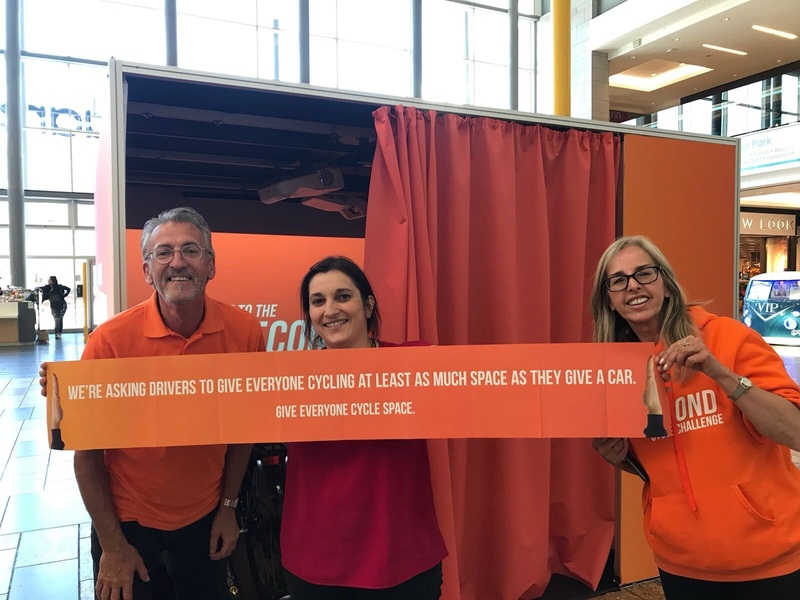 In 2018, our media campaign was complemented by an interactive simulator which toured shopping centres in Aberdeen, Dundee and Glasgow, inviting drivers to try out a ‘30 second Cycle Challenge’. Audio and visual of a road accompanied the cycle on a stationary bike, with the added surprise of a moving wall that closed in on them, simulating a ‘close pass’ of an overtaking car. Over 800 people took part in the challenge with many of those who participated reflecting “this is going to make me more aware of the space I’m giving to cyclists".